email told them to phone and we would follow our usual procedures. which they seem unable to do. I am mightily peed off at the Police. I feel like sending the BIll to the Commissioner saying your daft advice landed us with this Bill. of course this will inhibit every other demo as we will simply refuse to allow anyone onto our property. so tempting to say - you are all numb-nuts as i am not the owner of the property and it is they you should be dealing with about your presence! A Tory MP’s attempt to placate a group of protesters camped outside his office backfired after he copied them in on an email in which called them “numb-nuts” and branded the police “daft”. 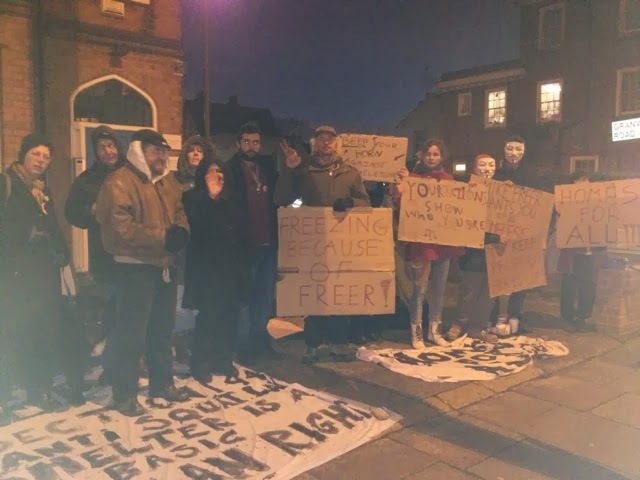 Last week, a dozen members of the Occupy movement launched a protest at the office of Finchley and Golders Green MP Mike Freer, who helped draw up the new law against squatting in empty residential buildings. 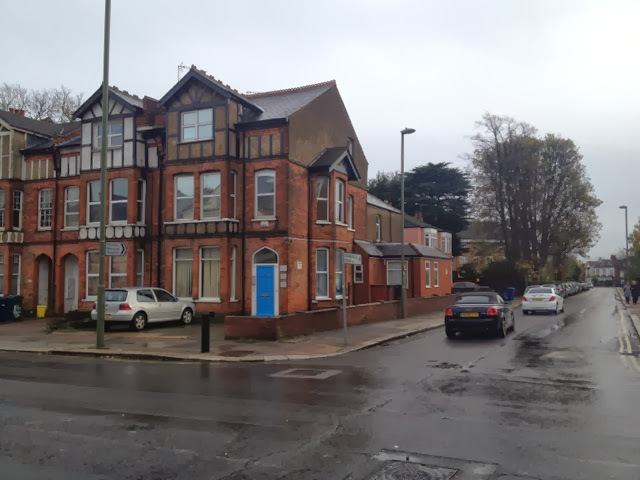 Mr Freer’s staff initially followed police advice and gave the protesters permission to camp in the driveway to stop them blocking the pavement outside his office on Ballards Lane in Finchley, which was Baroness Thatcher’s former constituency HQ. However, they later retracted this and hired bailiffs to force them out. 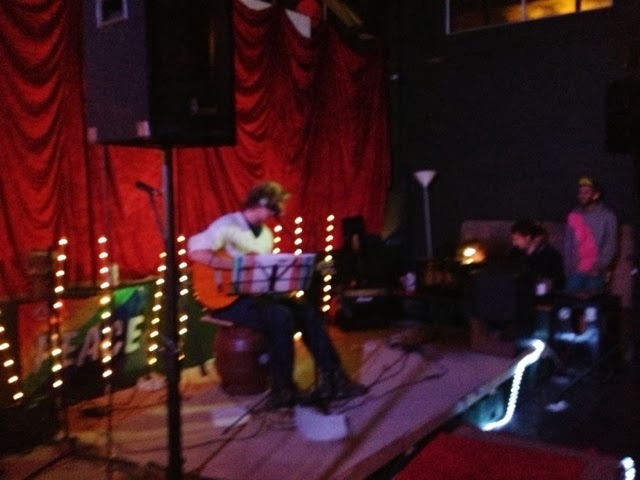 The group had vowed to stay until Mr Freer spent a night camping with them and he politely invited the protesters via email to meet him to discuss their concerns, which they agreed to do. However, in an email to office colleagues that was apparently sent to the protesters by accident, he wrote: “I am mightily peed off at the Police. I feel like sending the Bill to the Commissioner saying your fat advice landed us with the Bill. Of course this will inhibit every other demo as we will simply refuse to allow anyone onto our property. 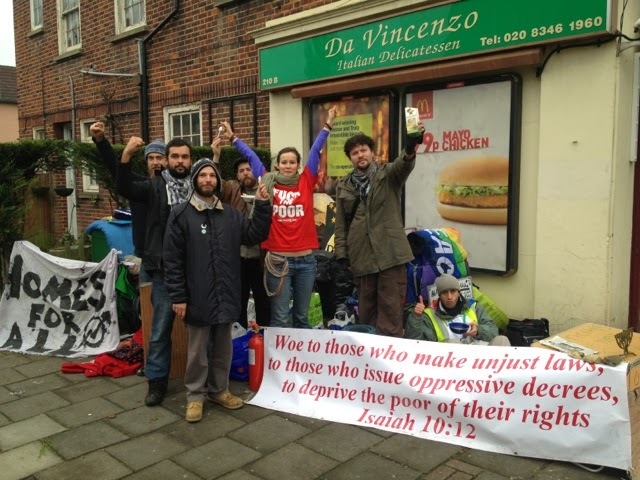 The “bill” was for the private bailiffs who arrived at dawn yesterday to remove campaigners and their furniture. The group has now set up camp across the road and around 50 protesters staged a demonstration last night that was broadcast online. A Met Police spokesman said it would not be commenting on the email. The Conservative MP in Margaret Thatcher's former constituency has made damning comments about police officers who have been overseeing a week-long housing protest on the forecourt of his constituency office – in an email intended for a colleague but instead sent to the protesters. The Finchley MP Mike Freer describes advice from the Metropolitan police about how to manage the protest as "daft". The protesters have nicknamed the disclosure as "Daftgate". Freer was already facing embarrassment about the week-long housing protest in his front yard. Since last Friday protesters had set up two tents and a gazebo and slogans have been filling the forecourt. Many of his constituents have come along to support the week-long protest. In the email – seen by the Guardian – he calls the protesters "numb-nuts" and the police "daft", saying: "I am mightily pee'd off at the police. I feel like sending the bill to the commissioner saying your daft advice landed us with this bill." 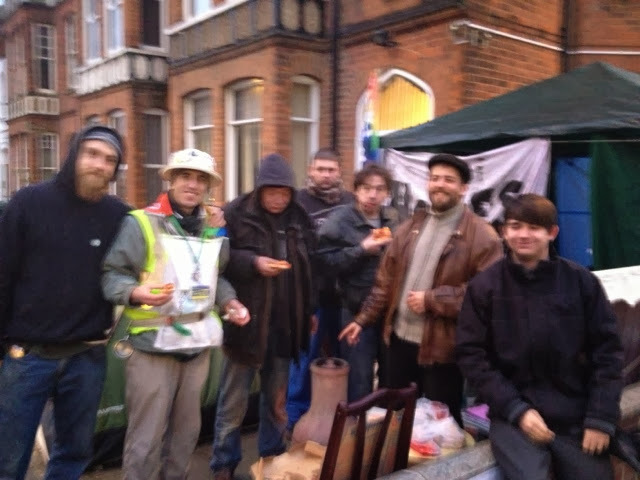 The six protesters camped on the forecourt for the past week were removed by bailiffs at 6.30am on Friday. Pete Phoenix, one of the demonstrators, said the protest focused on legislation, introduced last year, that made squatting in empty residential buildings a criminal offence (it was previously a civil offence). Freer is an architect of the law – section 144 of the Legal Aid, Sentencing and Punishment of Offenders (Laspo) Act 2012. Phoenix said: "With 1.5m empty properties in the UK and a rising problem of homelessness – estimated at 400,000 hidden homeless – the time and effort being put into criminalising sheltering in empty properties (squatting) goes against common sense. "These laws are a further example of attempts by the current government to penalise the poor while tax evaders and corporate profiteers run away with the stolen wealth of the country." The protesters say Freer's office allowed them to protest on the forecourt last Friday. They then construed this invitation as a licence to remain and the standoff between the two parties began. When the bailiffs arrived, they gave the protesters a notice in the name of Finchley and Golders Green Conservative association asking them to vacate the premises under common law, a rarely used legal route. Freer said: "The squatters and the camp were disrupting my constituency office and its presence was intimidating. A polite request for the squatters to leave was ignored as were instructions on how to arrange an appointment; it was decided we had no alternative but to lawfully remove the squatters from the property." Paul Ridge, a solicitor at Bindmans, who has been advising the protesters, said: "The manner of the eviction was very unusual. It seems that self-help remedies under common law were applied instead of going to court to seek an eviction order. "Mike Freer may not like what has happened but the police behaved entirely properly during this protest. Police are not there to adjudicate between two parties who disagree but to uphold the law. "The key issue here is about the right to protest. The police were clearly satisfied that no criminal offence had been committed." 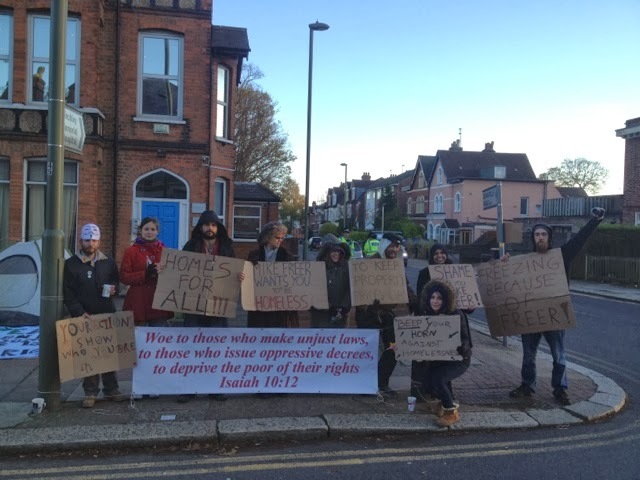 A Met spokesman said: "Barnet officers were at the constituency premises of MP Mike Freer this morning whilst bailiffs moved the protesters on. Officers from Barnet were there to prevent a breach of the peace. No arrests were made." Thursday November 28, 2013 at Mike Freer MPs Tory HQ Barnet 212 Ballards Lane East Finchley. If you're affected by the Cuts, high rents, benefit caps, the anti-squatting law,the bedroom tax,or workfare slave labour. Find your local MP and occupy outside their office. 1) The repeal of section 144 the law that criminalises sheltering in empty buildings (squatting) and the repeal of the LASPO Act.which has removed our rights to Legal Aid. 2) The 1.5 million empty buildings in the UK to be used for homes, community centres and to create employment. 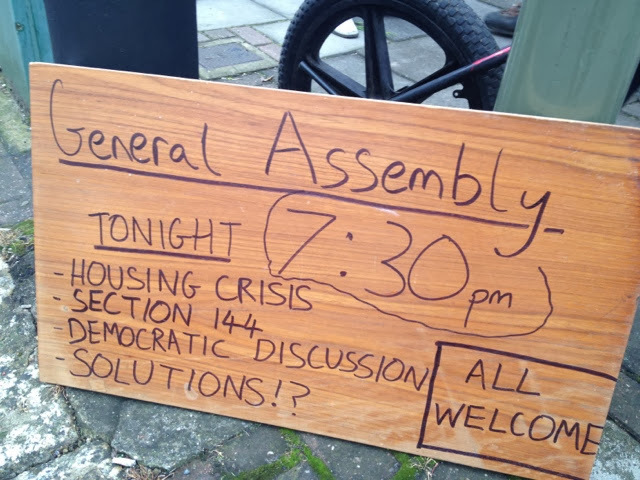 3) a National Housing debate on the housing crisis in the media and online. 4) That no one freeze to death in the winter when there are so many empty buildings. 31,000 people died this year from fuel poverty homed and homeless. The big six companies energy profits are up 500% in three years to 1 .2 billion. We call for the renationalisation of the energy companies. 5) Housing is a fundamental human right and property rights should not trump those rights. 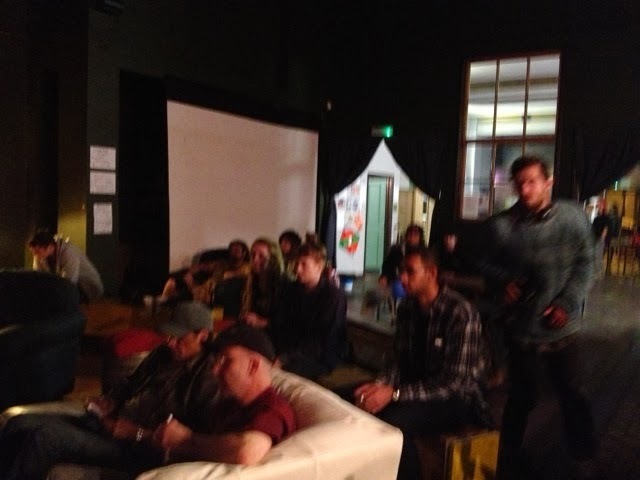 6) Solutions to the housing crisis need to be put into action, all cooperating to make this happen. To be sent to all MPs, press lists and social media. Mike freer Mp not wanting any more direct Democracy debates on his doorstep sent in the heavies to evict under old Norman common law, we have more big baillifs than you.bindmans solicitors say its regrettable that top Tory MP did not follow usual legal process, he has taken the law into his own hands. To forcefully evict a peacefull protest. The protest continues come and support even though you strike us down we will just become more powerfull than they can possibly imagine.come for occupy London General Assembly 212 ballards lane east finchley 7.30 pm tonight on the housing crisis repeal section 144 unjust anti squatting law and housing issues network it far and wide.up from the ashes of eviction u cannot evict an idea mike freer.
! *Spring Place resists*! 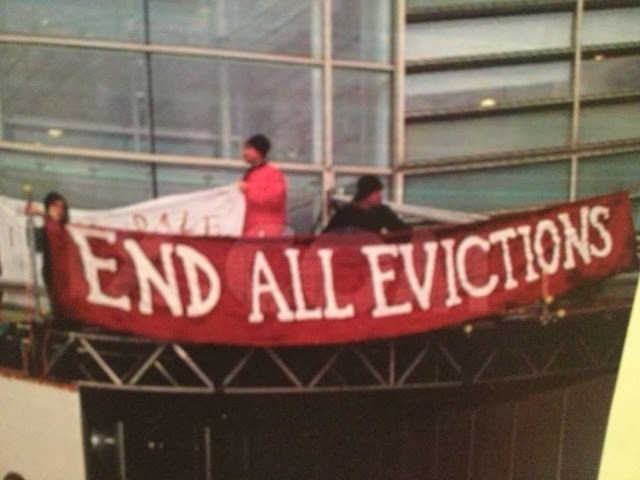 Tomorrow (thurs 28th) @ 10.30am, county court bailiffs. 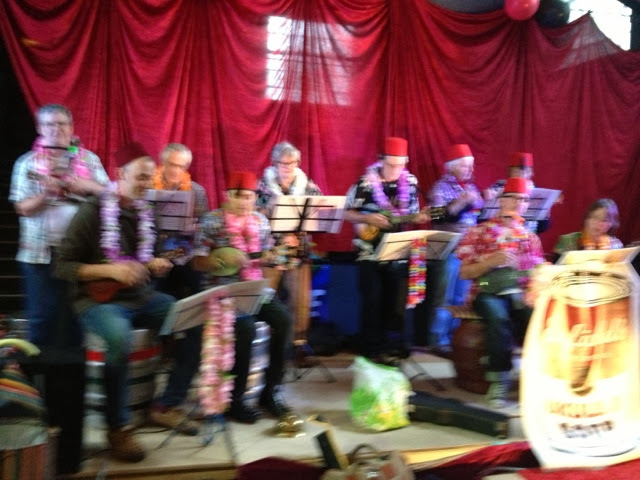 Fancy dress competition (if it takes your fancy), breakfast + street performances. Come help us resist this awesome building. 8-9 Spring Place, nw5 3er. Solidarity squat massive! The group have set up camp on the driveway of the office - now used by Conservative MP Mike Freer- and are refusing to leave until he spends a night camping with them. One of the group of around a dozen activists said they had chosen to target the location because of its history as the birthplace of Thatcherism. Another, Daniel Gardonyi, 32, vowed they would stay camped outside the office of the Finchley and Golders Green MP until Mr Freer joined them. “Mike Freer tried to kick us out. We will stay until he comes and speaks with us and sleeps in a tent to see what it is like, so he can relate to the homeless,” he said. But Mr Freer called the protest “futile” as he had not been at his constituency office since Friday. “They arrived on Friday and protested outside my office but they hadn’t worked out I would be in Westminster like every other MP. “They have rung the buzzer of the office but that’s the sum of all contact. They have a view and I disagree with it. Camping outside my front door is not going to persuade me to change my mind. The activists claimed they had been given verbal permission to camp in the driveway but Mr Freer denied this. “Initially it was fine but by camping they are intimidating and deterring my constituents from coming to the door. I’m hoping they will see sense and we are considering our next step,” he said. Baroness Thatcher’s political career officially began when she was elected as MP for Finchley in 1959. She served the constituency throughout her time as Prime Minister and only stepped down two years after leaving Downing Street. 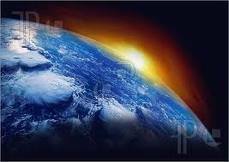 • No man is an island, as they say, and MPs will have this in mind as they pronounce in parliament. The general can very quickly become specific; chickens come home to roost. 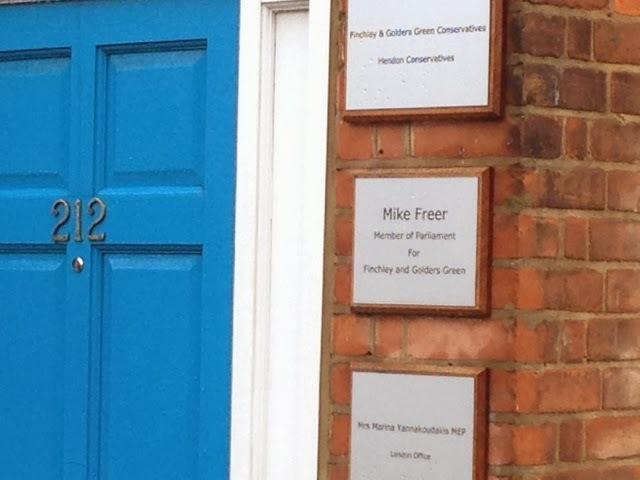 It was Finchley MP Mike Freer's destiny perhaps to become the driving force behind the government's tough new anti-squatting legislation. But tough as it is, it isn't helping him with the squatters who have for the past four days occupied the yard outside his constituency office, Margaret Thatcher House, once the seat of power of Baroness Thatcher. For all the new legal powers, it's complicated. 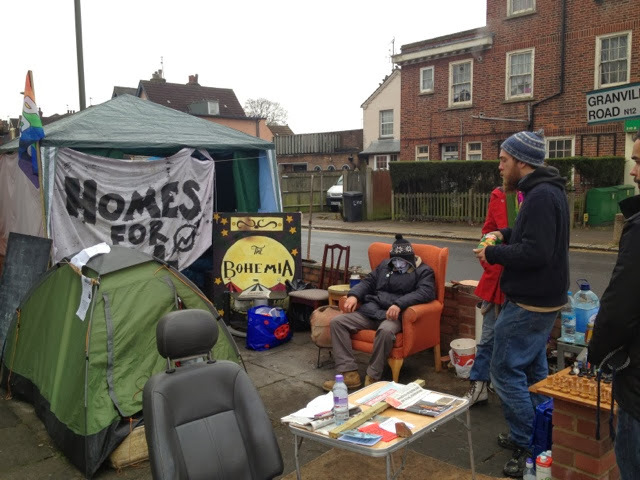 The squatters say officials in Freer's office told them they could protest in the forecourt rather than languish on the pavement. And that, the squatters say, represents a licence. And that means they're staying. Freer and his people are looking up the rules and trying to sort it out. Might be another job for parliament. Call out for support at the Gloucester Arms 59-62 Leighton road. NW5 2QH. Police threatening to arrest us. 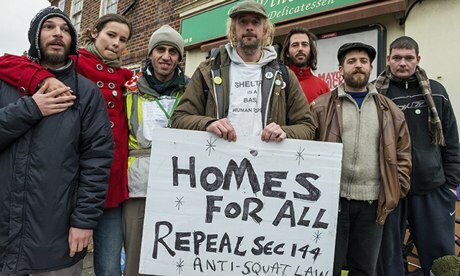 Homes for all campaign repeal section 144 anti-squat law demonstration : Friday 22nd nov 11-6 pm. 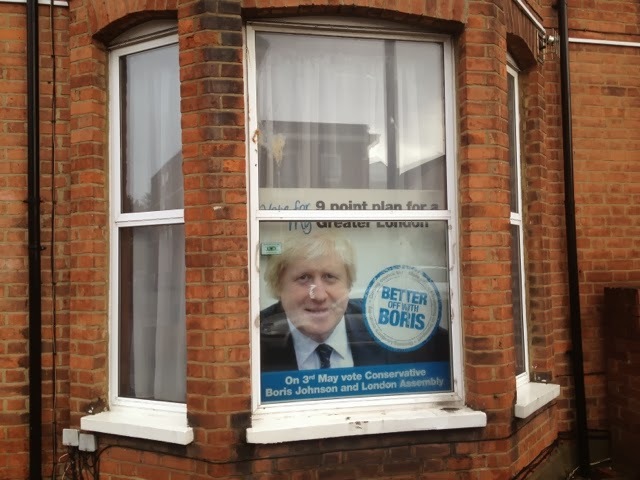 Outside of the Conservative MP Mike Freer constituency office (co-architect of the law) corner of Ballards lane and Granville rd N12 we have Occupied a squat opposite. Bring banners tents placards. 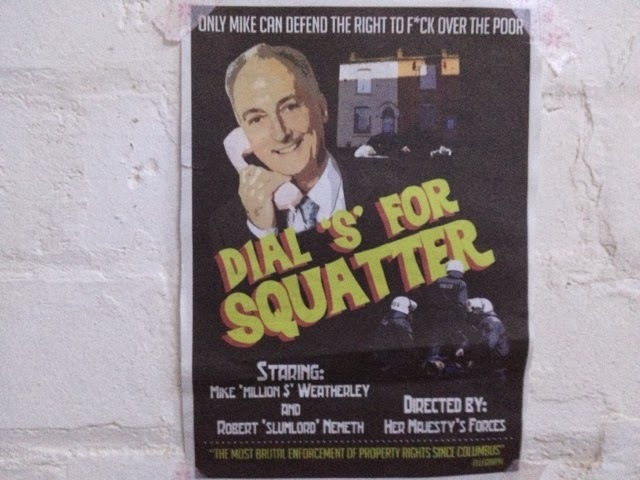 This Friday, squatters, community members and housing campaigners will demonstrate outside Mike Freer MP's constituency office in Barnet. The demonstration is response to the recent violent eviction of the Bohemia, a popular squatted social centre nearby. The demonstration is also a call for an immediate repeal of section 144 and full adequate investment in social housing rather than criminalising the homeless. R.I.P Killah P Hip Hop Against Fascism Saturday 16 November. Awate - Logic - Big Cakes - Caxton Press - Wildeye - Dekay & Act on words - Dope Biscuits - Sense C & Ruby Kid. Live set: DJ Snuff - DJ Steaz - Dissident Island DJs. Doors open 6pm for talks, screenings & food. 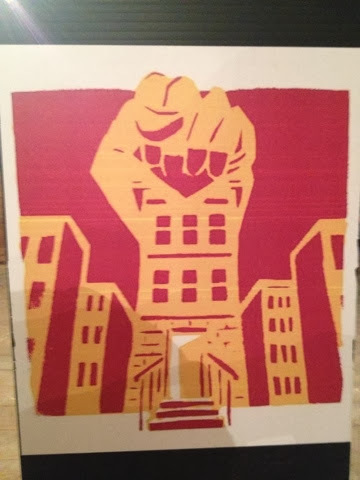 Press release from Housing Action Southwark & Lambeth - 28th October: Housing activists have occupied a property owned by Southwark council which was due to be auctioned today at a starting price of £2.3 million.